Mario Balotelli scored his first league goal in a Liverpool shirt to give the Reds the edge over Tottenham in a captivating clash at Anfield. Lazar Markovic completed an optimistic start for the home-side, managing to find the net Lloris failed to keep out his left-footed attempt that trickled into goal. Spurs would get back on level terms soon enough however, as Harry Kane continued his incredible goal-scoring form to even the sides at the half-time whistle. The game followed the high-octane nature in the second phase. Some magical footwork by Daniel Sturridge won a penalty for Liverpool, and it was the skipper Steven Gerrard who broke his season tally into double digits with a fine conversion. Officials would be the focal point again as Simon Mignolet was livid when Harry Kane assisted Mousa Dembele for the equaliser after Christian Eriksen's free-kick was parried. But that would not be the end of the tale, as Mario Balotelli hit home with his first league goal for Liverpool, guiding in from Lallana's ball to give the Reds the win at Anfield. 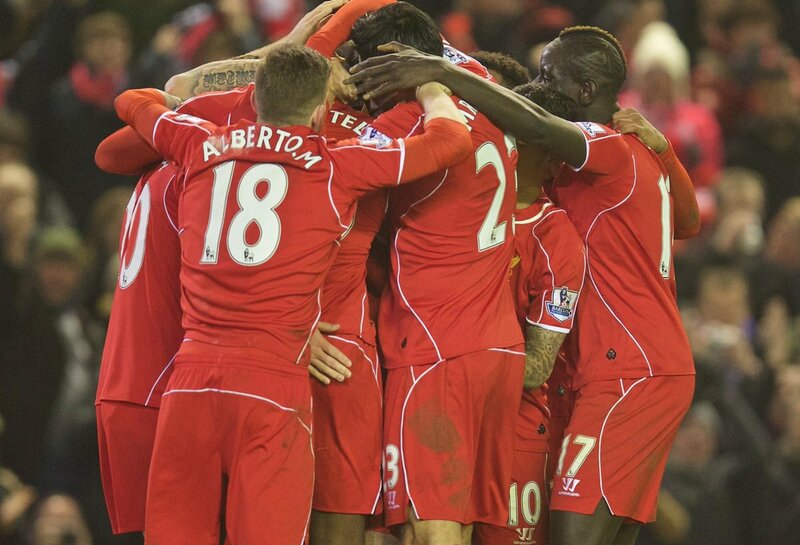 A great noise reverberated around Anfield as the hosts got the ball rolling. Spurs set out to ease in possession but were stagnant to deal with the furious pace of Jordon Ibe, winning an early corner-kick which amounted to little following Steven Gerrard's delivery. Continuing to deploy numbers as they raced forward, they could've found the opening had Raheem Sterling's pass to Philippe Coutinho carried less weight. After Danny Rose recklessly snatched his shot wide, the deadly, on-form Harry Kane upheld some light penalty appeals as the striker believed he was fouled by Simon Mignolet. Speaking of the other prolific English striker on the other side of the pitch, Daniel Sturridge was in full stride to escape Eric Dier, but he couldn't find enough power to angle it through the away keeper. Steven Gerrard got some North London hearts racing after his free-kick attempt whistled over the crossbar and into the Kop. Their positivity continued to show when Alberto Moreno fed Lazar Markovic but the Serbian couldn't composedly stop the ball to have a go, instead mis-controlling a volley. With the Reds continuing to press, Hugo Lloris was forced into action denying Sturridge's well-hit strike. Jordon Ibe kept possession on the right flank, before it fell to Markovic who set up Sturridge for a stinging attempt, swerving to the left of goal only for the French keeper to palm away. Tottenham may have been forced to do a vast load of work to keep Liverpool at bay for the opening ten minutes, but when they were given a glimpse, Harry Kane alerted the defence with his breach into the area. Just as he prepared to pull the trigger, he was stopped well by Skrtel. On the subsequent counter-attack, Brendan Rodgers' men struck first blood. A long ball over the top was kept under control by Daniel Sturridge, and as it came off his boot, Markovic pounced on it, biding his time before somewhat scuffing his shot—albeit on target—and it bobbled past Lloris for the opener. Spurs looked to put away the rare howler of their captain instantly, as Jan Vertonghen charged forward from an interception. Feeding through Christian Eriksen, Mignolet's goal would go unfazed after Emre Can timed a perfect block to thwart him. Erik Lamela audaciously attempted a back-heel from the corner, but imposing themselves in the area, the three centre-halves dealt reliably. Seconds earlier, Ryan Mason saw his long-range effort fall tamely into the hands of the keeper. Tottenham almost shot themselves in the foot when Daniel Sturridge again found himself charging alongside Eric Dier. Making his first start for Liverpool since August, the number 15 was zeroing in on the waiting goal of Lloris, but Dier managed to stick a foot out. A bemused expression on the face of Liverpool's hitman said it all, it was a corner—unlike what the linesman ruled. Pochettino's side would seize the initiative through some dynamic link-up play between the visitors' maestros. Lamela transfered possession to Eriksen who in turn slotted to Harry Kane. Following a slip by Sakho, it opened up for Kane to get his 23rd goal of the season, firing it through Mignolet into goal. With the pendulum of momentum swinging yet again, Henderson found Moreno with a sublime ball, but Spurs stayed resolute. Likewise, they kept organised to extinguish the threat from corner kicks. After some minutes of more timid play—for both players and spectators to catch their breath—Jordon Ibe once again showed signs of flourishing in the Liverpool colours. Running at a tangent, he found space to produce a left-footed shot too hot to handle for Lloris, parrying it out before the clearance. With the half-time whistle nearing, Jordon Ibe again proved uncontainable, ghosting past to give Sturridge a go at goal. Facing away from goal, he attempted the spectacular with a backheel, beating Lloris but also clipping the post. Some intricate footwork by Daniel Sturridge, on the first big event of the second half, would lead to a penalty. The striker was able to evade Dier, before being impeded by Danny Rose, and a spot-kick was awarded. Liverpool's skipper re-instated the lead in fine fashion, giving Lloris no chance of stopping as he thumped it into the top-right corner. Simon Mignolet pulled a save out of the top draw to deny Lamela's long-range bullet. As players compiled around the box, the Argentine let fly aiming to the top-left corner. An aware Mignolet pounced to tip it over the bar. In an attempt to make things uneasy, Spurs kept things full-throttle to find an equaliser. Harry Kane was unlocked to the right of the box, but Martin Skrtel denied him. The corner-kick that followed was again, well dealt with as Liverpool continued to lock away their setpiece frailties. Christian Eriksen employed his free-kick magic to force the equaliser. Well in range, from the left, he curled in forcing Mignolet to palm away. Harry Kane—appearing potentially a whisker offside—was first to pounce on the rebound, cutting it back, where it would come Dembélé and find its way into goal. An irate Simon Mignolet would appeal to the linesman, but to no avail, and it was all square once more. Liverpool had further appeals to the referee when Daniel Sturridge went down in the box at the hands of Eric Dier. Officials denied as a much-debated call saw Dier wrap a leg around the striker. Once again dictating the game, Daniel Sturridge this time passed to Alberto Moreno, as he was on full stride into the box. The Spaniard attempted to sneak it into the pocket at Lloris' near-post, but to no avail. With the game winding down, Mario Balotelli would step up. Scoring his first league goal for the Reds, he simply put a boot to it as Adam Lallana fed him through, and Liverpool took a lead for the third time, with Anfield erupting in Euphoria. Emre Can slashed high and wide, but Liverpool got ever-closer to victory. Tottenham players flooded the area in a free-kick, and the hosts defended well. After Sakho took some time to nurse an injury, the hosts continued to eat away at the clock. "You'll Never Walk Alone" was sang triumphantly, the final whistle blew, and Liverpool were given a major boost in their race for European football, prevailing in a phenomenal game of midweek football. A truly cracking contest of football. It simply came back to who needed it more. It was exciting, end-to-end, and a game which further opened that heated race for Champions League football. Both sides fitness showed with their ability to get up and down the pitch so quickly. More fuel to the fire as you'd call it, the Reds' pacey start almost took Tottenham by storm—in which we had seen numerous times before. However, despite conceding the goal, Tottenham did not panic and stayed composed. Their equaliser came from, you guessed it, Harry Kane. Continuing his brilliant form, he didn't exactly have the best of halves in the second but that cannot be blamed for the loss. Liverpool could have felt hard-done-by had they lost considering the goal was offside, but on Tottenham's case it was a razor-close call. Emre Can and Jordon Ibe were exceptional in the game. Ibe's ability to ghost down the right and put so many balls in, while Can continued to keep organized, it was vital for their victory. Eventually, Balotelli's time came, it's now a question of how well he can act on it. 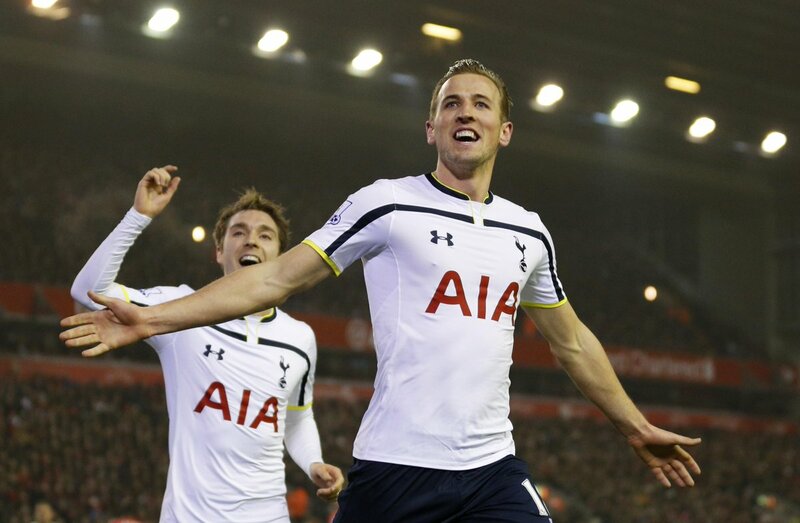 More: Harry Kane the future of England? 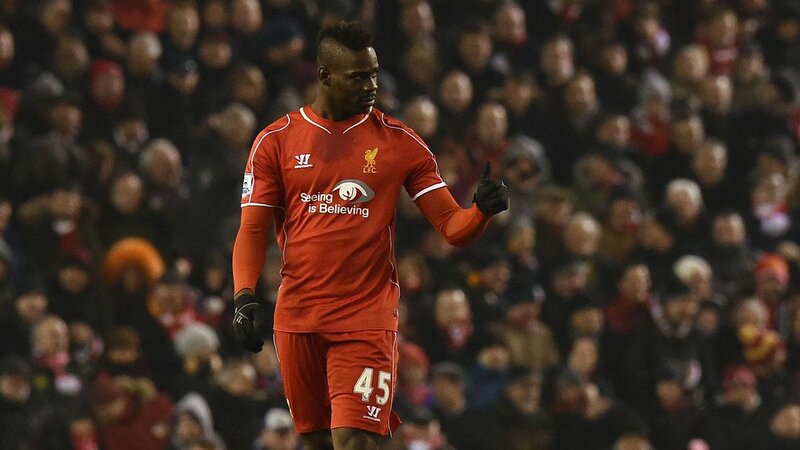 Mario Balotelli ends his goal drought to give Liverpool a win in a thrilling game against Tottenham.